Professional chefs around the world rely on Magic Seasoning Blends® for quality, consistency and distinctive flavor profiles. From high-volume commercial restaurants and small independents to large-scale manufacturers and nutrition-focused K–12 kitchens, discover how our premium foodservice products and custom blends can bring more flavor to your business. Crafted with the professional chef in mind, Magic Seasoning Blends offers a family of seasonings, sauces, and smoked meats perfect for every recipe and service style. Plus, our fully staffed research & development kitchen can create custom blends for chains and national accounts. 45 versatile blends, 5 sauces and marinades, smoked meats and more! Meet school nutrition goals with a flavorful range of Magic Seasoning Blends crafted to satisfy sodium targets without compromising taste. School nutritionists can rest assured that each seasoning is made from our unique blend of delicious herbs and spices perfectly suited for supporting healthier diets while providing great-tasting flavors students are sure to enjoy. 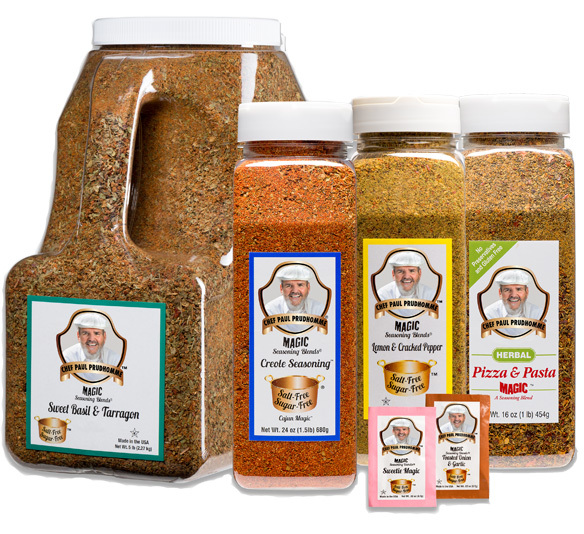 Add restaurant-quality flavor with our collection of sweet and savory seasoning blends featuring ZERO sodium and no salt substitutes, gluten or MSG. Versatile blends bring big flavor to your dishes with only 140mg of sodium (or less) and no gluten or MSG. Click on the links below to learn more about our K–12 program and products. Custom blends are one of our favorite challenges. We’re focused on creating flavors with an intense emphasis on taste. Whether matching blends or creating unique flavor profiles, our full-service R&D test kitchen, and 125,000-square-foot SQF- and kosher-certified blending and packaging facility can make it happen. And while we have the most modern technology at our finger tips, we still rely on our experience, because nothing is as subtle or innovative as the human palate. Magic Seasoning Blends is available in over 30 countries around the world. Select your location from the menu below to connect with a Magic Seasoning Blends representative. Shalit Foods, Inc. Ron Shalit 601 Magnetic Dr.
Mor Yam Marketing Ltd. Jack Kaminker Kibbutz Tsora D.N.